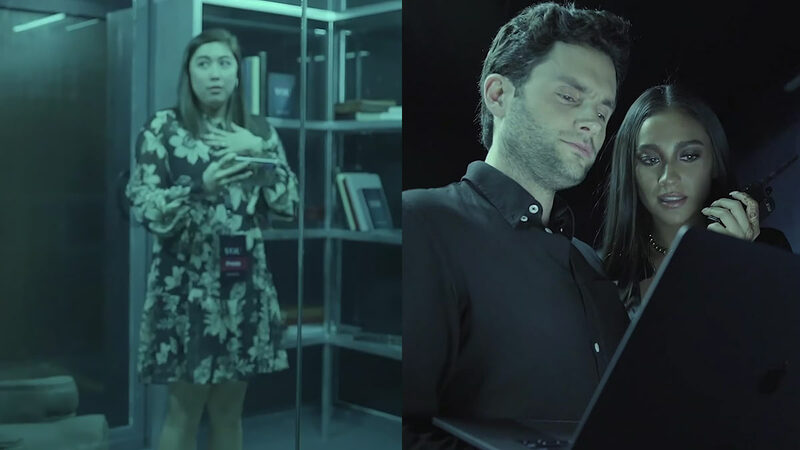 This past week, Netflix stars Penn Badgley and Shay Mitchell were in the Manila to promote their highly-addictive new show You. On Tuesday, January 15, the two held a fan meet where thousands of their followers (myself included) flocked to Greenbelt 5 to see a glimpse of them IRL. While they engaged the crowd in a fun Q&A sesh, a lucky few were given the chance to meet with Penn and Shay in a more ~intimate~ setting. One such fan is vlogger Dani Barretto, who filmed her encounter with them inside a replica of the show's infamous ~glass case~. Dani was standing inside the glass case (ala Benji, may his soul rest in peace), when Penn and Shay entered the space with only glass walls separating them from each other. "I can get stuck here just as long as you're out there! It's fine! Totally fine!" she said with so much kilig. WHAT A LUCKY GIRL YOU ARE, DANI.